for me still stuck in ADLS/VDSL land for another year or so, moving from Bigpipe to Voyager is a no brainer - I can get static IPv4 and IPv6 with no CG-NAT etc, and take my own equipment along with no lock ins for less than the cost of BigPipe. There is no real differentiator between Bigpipe naked DSL/fibre and Spark naked DSL/fibre plans now from what I can see. Vast majority of us geeks will have already pushed our voice stuff (if still required) from ISP to VOIP services like 2talk and vast majority of us already have Netflix/whatever, and we'll already have our own modem/routing equipment. Why on earth would anyone lock into any sort of commitment with an ISP - especially one with no ETA on something like IPv6? I do sympathise with Spark's position here, but as a consumer with no contract I'm free to move between providers to get the services I need/would like to use. Also for anyone contemplating ipv6 - there are a bunch of complexities; Cisco ATA doesn't work with ipv6, Disney Circle doesn't do IPv6 natively, DNS switching requires an IPv6 DNS aware provider etc etc. A big shout out though to the entire bigpipe team - their support has always been excellent from my perspective, and communication has always been transparent - nice work! [snip] Removing support for IPv6 is tragic and reprehensible. At this point IPv6 should not be a lab project, it's a deployment project which should have clear action items and timetables. We are _literally_ years into the exhaustion of IPv4 addresses and IPv6 should be as much a part of a large ISP's offering as IPv4 imho. "Watch this space" may have been adequate at one time but, accepting that it was a beta trial, there should at least be an announced implementation date even if it's the xth quarter 2018. Unfortunately in the real world here in NZ, there are FAR more important things for us to spend time and money on AT THE MOMENT. I guarantee you that the engineers would love V6 to be running now, but it doesn't really provide a significant benefit to anyone at the moment, and the other stuff we are doing with money and time does. Spark has heaps of IPv4 left. We're not running out anytime soon in our fixed BB network. And at least from a technical standpoint, I'm not comfortable giving any timeframe for implementation because priorities change and I'd hate to say a date and then miss it because we directed resource to a more important project. Ultimately there are other ISPs that have IPv6 running today, and choice is a great thing - it's a truly competitive market out there. We absolutely want our customers to stay and we believe that the other benefits (international performance, access to a greater number of MUCH larger and more distributed CDNs) will satisfy most Bigpipe customers. If there are a few customers that absolutely NEED IPv6 then we'll be sad to see you go, but if you need v6, you need v6. 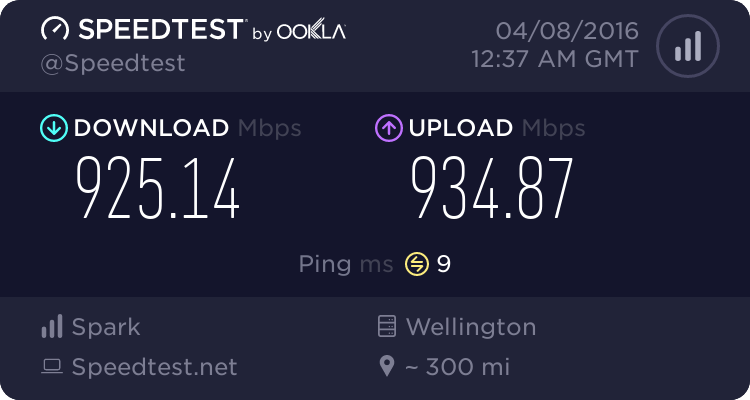 I've looked at 2degrees offering and on an ADSL only connection (limited by my location), on an open ended contract - 2degress is significantly more expensive (as all our mobiles are with different providers), and the factI believe I'd need to spend $10 extra each month for a non cg-nat ipv4 connection (for VOIP) and ipv6. Just checking - as far as I understand it 2degrees doesn't use CGNAT, so the $10/mo is only if you need a static IP. Someone please correct me if I'm wrong. jmosen: When is the migration due to happen? From the 12th of June. I can't be any more specific than that at this stage, sorry. Respectfully the amount of IPv4 address space that Spark has is not the issue. From what I understand Spark's No.1 priority right now is the final stages of a move to a 100% Spark owned backbone that does not rely on infrastructure owned by Chorus since the split. I'm guessing services like the backbone network Bigpipe runs on, dial-up, Local peering etc.. all touch infrastructure now owned under the Chorus umbrella and must be shut down as they distance themselves from Chorus. Moving to the Spark network and maintaining IPv6 at the same time is not possible. The performance and coverage benefits for customers, and the efficiency benefits for us wildly exceed the downsides of TEMPORARILY losing IPv6. Which tells you how much Spark has been dragging the chain on IPv6. It's 2018, why does Spark not have IPv6 ready to go already? And don't give me the "It takes time!" BS, you've had what, 20 years? Spark/Telecom aren't a bank. Which tells you how much Spark has been dragging the chain on IPv6. It's 2018, why does Spark not have IPv6 ready to go already? And don't give me the "It takes time!" BS, you've had what, 20 years? Spark/Telecom aren't a bank. I don't know how much clearer I can be. It's not done yet because it's not in high demand and there are still better places to invest in terms of improving the customer experience. It is happening now, but it's not being driven by residential BB demand. We have limited resource (engineers, time, money) and we spend those resources where us and our customers will see the biggest benefits. You don't have to like it, you don't even have to agree with it - but you have to accept it. We have a better view than anyone on this forum of what our customers want and how they use the internet (not down to site monitoring per user - we don't do that), and IPv6 is simply not in demand. Our customers want more bandwidth, better streaming, better WiFi etc - not IPv6. If you can come up with a business case why we should divert resources to a feature that will bring no revenue, attract no customers, and have no positive impact on the user experience while simultaneously taking investment away from what people really want, then great, please enlighten me. But I GUARANTEE you, you won't have thought of something that the engineers in Spark haven't already thought of and have tried to make a business case work for. Even as a design engineer who would LOVE to see V6 done sooner rather than later, as someone with a strong customer focus, I can hand on heart honestly say that investing in making the experience better for 99.999% of users is a better outcome than catering for the 0.0001%. Which is to say, never, because anyone who needs or wants it will have moved to providers that can provide it. As for the rest of it, I bet you that you'll always be doing all the other stuff and so you'll never get around to it. I'll bet you a pint of beer that Spark won't have IPv6 rolled out to all their residential customers come 2020..
You don't have to like it, you don't even have to agree with it - but you have to accept it. You're simply wrong. We don't have to accept it, there are way too many other providers out there (thankfully) that we can (and some of us have) moved to instead. Your uptake was tiny, simply because you only offered it to a small subset of users (those on geekzone). And telling your customers (who are time and again tell you it's important to them) that it's not needed, or important to them, is certainly not going to win you any new customers or favors with the current ones. I'm out. Telling us that we'll never roll out V6 or asserting that it's a major desirable feature is the sort of thing I honestly can't argue intelligently with. I'll address new issues only in this thread. some people need to take their anger with this decision else where, whats done is done and its a buisness decision and made for obvious reasons. this thread doesnt need all the anger in it. Will the VLAN tagging configuration be changing?? Personally, i look at the resolution actions by other RSP's being "Turn off IPv6" as a action, as not a valid action but a temporal troubleshooting step. Your talking full training for all assure agents, Documentation updated etc. the other thing is the network guys are literally my favorite here. They not only look to enable a feature, but they tune the living crap out of it to get the best user experience. i fully expect when v6 does go live, it will be a user experience that has been crafted, tested and put through the ringer to avoid the rocky issues other providers have had.